Ajay Kumar Singh > WordPress > Oops! Sorry an error has occurred. Please click here to contact us so that we can fix it. I never had any blog on WordPress.com and the reason is their draconian policy of removing a blog without any reason. You spend all your time in creating a blog on WordPress.com and for no apparent reason it is gone one day leaving you frustrated. Lately a lot of social media platforms are closing down and most of them offer option to migrate to WordPress.com. MSN Spaces, Knol are just few examples. 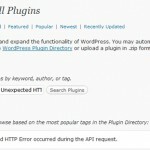 When I tried to create a new blog on WordPress.com I started to get error. I get following message whenever I try to create a new blog. First I thought it might be the blog name which they might have marked as spam or something. But this happens with any blog name I select. Not sure what is the problem. There is no solution available at all, WordPress support forums seems to be silent with this error as well.